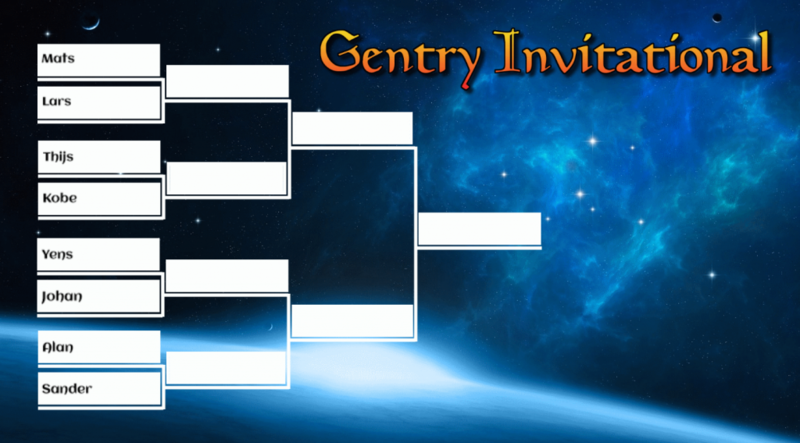 The Gentry tournament circuit is focused around two Gentry Opens that take place around rotation and about halfway through the year. That means there is an April edition and a September edition. These are the only Competitive events the League runs and are a way for us to carry our format out a lot wider. You can find a link to the upcoming edition here. 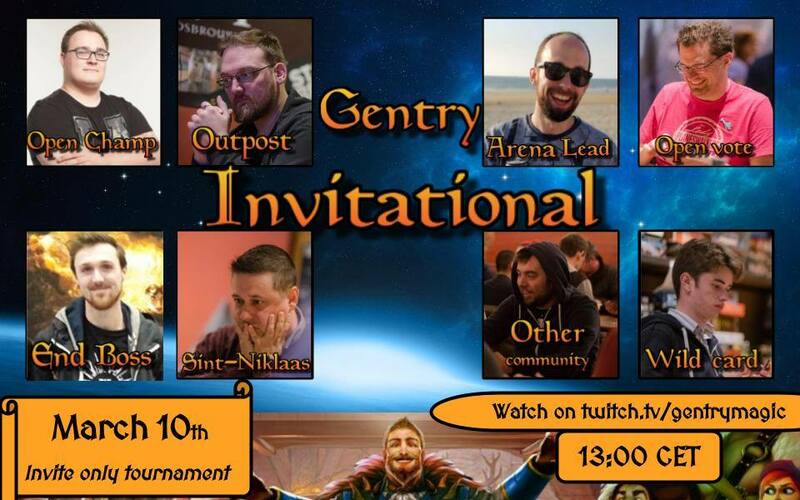 Sander De Quick has won the last edition of the Gentry open in september 2018, securing him the first slot in this Invitational. Alan Schuer and Yens Goethals got their slots by being in the lead of the Outpost Gent and Magic Arena Leaderboard respectively. All the other inductees earned their spot by popular vote: Lars Meeussen took the Open vote after Pascal Vieren and Emma Mangodt could not make it, Thijs Weytens replaced Tom De Wael who was kept from attending due to illness, Mats Clays was a clear winner in the St Niklaas Community vote, as was Johan Meys in the ‘Other Community’, hailing from Merksem, a small but very stable community that deserves some attention at this point. And then finally, Kobe took home the wild card after scoring high in a lot of other categories and being an interesting deckbuilder and analythical mind of the format. At the time the Gentry Invitational was hosted most attention has gone out to Guildgates, with Gates Ablaze, Gatebreaker Ram and Gate Colossus pay-off cards that break parity in Gentry. Sander analysed this perfectly when he explained the design filosophy that created them: These cards are balanced in Standard because they force you to play a subpar manabase that cannot compete in versatility and speed with the different rare lands. In Gentry, however, Guildgates and the other set of dual lands that enter the battlefield tapped, are backbones and foundations of the format, giving these cards no drawback to speak of. In the other corner, we have mono red burn, which got a giant power booster in Ravnica Allegiance with the Spectacular Skewer the Critics and Light up the Stage. There has been a lot of testing with the different shells and subtypes of the deck, with Light up the Stage and Flame of Keld dividing the two camps for the longest time until people started realising that putting them in a deck together gave the most afgressive deck in the format some of the most efficient card advantage as well. Does that mean there is nothing else? Of course not. It just means that when making a new deck in Gentry, it would be wise to prepare for these two decks as counterparts to the metagame. And, most importantly, both have weaknesses against different white cards in Ixalan’s Binding and Revitalize and Healing Grace. And these are the decks the players chose to register for the event. Mats is a competitive player with a long history in the game and has a name of showing up with very simple yet streamlined decks. He did not disappoint in this regard, showing up with a monoblack disruption deck that is honed and preboarded to deal with control lists and slow decks. Lars replaced Emma Mangodt and in an effort to honor her slot, he chose to play a deck designed and optimized by Emma. Rather than going for a slow grinding finish this deck aims to end in a big storm. Thijs was a last minute replacement for Tom De Wael, who fell ill just days before the event. He has been championing the Temur Gates Control deck up to now but chose to show up with a Wilderness Reclamation List that is very focused on Nexus of Fate, forgoing all copies of Gates Ablaze in favor of Murmuring Mystics. Kobe showed up with a Wilderness Reclamation deck as well, him being probably the first person to build and play the deck in the Gent community. He opts for a secondary win condition in Electrodominace + Fight with Fire, both which can be found with a single Invert // Invent, giving a possible one-hit knock-out on turn 6! Yens descended upon us from the Magic Arena Leaderboard and may have been a bit impacted by card availability and familiarity with the best-of-3 format. He used Thijs’ article on Temur Gate Control as his guide and entered the tournament with the 75 below. There is nothing super innovative or fancy here, just good old solid deckbuilding. Johan was going to be an unknown factor in this event no matter what, coming from a very isolated community in Merksem, no one else had an idea what is played there or what kinds of decks Johan himself would prefer. He ended up bringing Goblins, an archetype unheard of up to now, supported by Calvacade of Calamity. After the match it was clear the deck had huge potential but needed some polishing, showing some mana issues and a lack of hasty finishers, both of which can be addressed by adding Goblin Warchief to the deck. Coming into the event, Alan was seen as the biggest constant in the Gent community. Everybody was sure that he would show up with his trusty Monored burn deck. There was discussion he might throw a curveball and take advantage of people that would change their deck choice and composition because they knew they would be facing off against him but in the end, the world made sense, and Alan came to bring down fiery justice. Of all the players in this event, Sander probably took it the most serious and showed up with a Jeskai Gates Control deck that was geared towards beating both other Gates decks and Mono red. For everybody looking to have a strong and versatile deck in the current metagame, look no further. The event was streamed on twitch.tv and is now available on our Youtube channel. Don’t forget to subscribe and follow if you want to stay up to date with all the developments in Gentry Land as we have an Open coming up that will deliver plenty of content as well.